Devo and apparel label semiFamous launch cool augmented reality effect on Facebook. Clever Fox, known for their virtual reality (VR) and augmented reality (AR) experiences in the genre entertainment and music spaces, has introduced them to Facebook with two compelling projects. 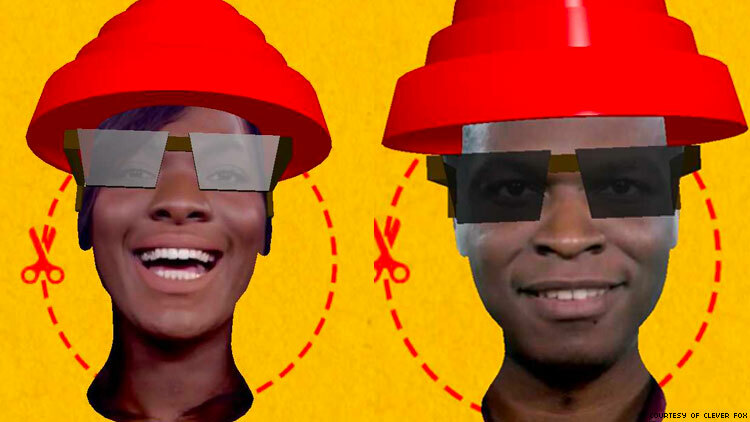 Released on Devo’s official Facebook page, Clever Fox created the artists’ first entry into augmented reality with a camera effect based on their iconic energy dome head wear. Recently, the world has been paying close attention to Devo. Their June performance, featuring Portlandia's Fred Armisen on drums, was a highlight of Oakland’s Burger Boogaloo music festival. In August, Vice’s Noisey published a massive retrospective article on the influential band. Devo was created by art student Gerald Casale in the wake of 1970's Ohio State Guard's massacre of Vietnam war protesting students at Kent State. Noisey says, "Casale was there among the chaos, running to escape the miasma of tear gas and bullets as two of his friends, Alison Krause and Jeffrey Miller, succumbed to gunshots from an M-1 rifle. The incident, which left a total of four dead and nine injured, would go down in history as a cultural loss of innocence, a particularly harrowing example of American political and social unrest during the Vietnam War." "Today, Devo’s mainstream legacy doubles as shorthand for 80s New Wave quirk — a group of synth-addled weirdos in red Ziggurat hats, yellow Tyvek suits, and a novelty hit, 1980’s “Whip It,” to their name. But to dismiss Devo as nostalgia compilation fodder is to overlook a body of work that feels prescient in both style and substance, rife with critiques of consumerism, right-wing ascendance, Midwestern paternalism, corporate monoculture, and geopolitical hysteria. Nearly 50 years later, the band’s story plays out like an uncanny harbinger of today’s post-Trump surreality—something Mothersbaugh sees flashes of in even the most unexpected corners of contemporary life." Watch Devo's 1978 Saturday Night Live Performance above. The AR effect has gotten the Devo fan community excited. Music isn’t the only place where Clever Fox is taking opportunities with Facebook’s augmented reality platform. They've also done a soft launch for apparel label semiFamous which features original designs augmented by Facebook’s AR camera. Clever Fox is also partnering with artists from outside of immersive media to create unique apparel designs at semiFamous. The first released design from an outside collaborator is a pair of colorful leggings emblazoned with a yowling cartoon cat. The design is by illustrator Emmet Helen known widely as the cover artist on Oni Press’s Rick and Morty comics. This type of partnership is indicative of how Clever Fox wants to grow the semiFamous brand. How does it work? Each purchase of an AR store item will be delivered with a design-specific URL for Facebook’s camera platform, showcasing the secret augmentations. Clever Fox is a Los Angeles-based production company focused on digital and immersive storytelling. Founded in 2015, their clients include Disney, Warner Bros, Hallmark, and Digital Domain.